Justin Smith has ordered a concrete tank that includes his vineyard soils. Saxum's Justin Smith likes his dirt. His James Berry Vineyard on the west side of Paso Robles was once an ocean floor, with fossils of whale vertebrae and distinctive limestone that help his grapes retain acidity as they ripen. When Smith visited Bordeaux and found out Château Pontet-Canet incorporated some of their vineyard earth into their concrete tanks, he knew he wanted to do the same. Smith sent some of his calcium carbonate-rich rocks to Sonoma Cast, a Petaluma-based concrete specialist. The rocks were ground into a powder finer than sand, then tested to figure out how much could be mixed with concrete and produce a tank with structural integrity. The customized aging tanks will be put into rotation later this year. Sonoma Cast founder Steve Rosenblatt is excited by the project. “It’s putting terroir into the tank." Smith’s terroir-tank project is unusual, but California winemakers working with concrete is becoming common. Concrete vessels aren’t new--they have been part of winemaking for hundreds of years. While they’ve been used consistently in Europe alongside wood vats and stainless steel tanks, in California they fell out of favor. Interest in concrete sparked again in recent years, but it took off slowly because the tanks were only produced in France, and shipping a 4-ton container overseas made them cost-prohibitive for most vintners. 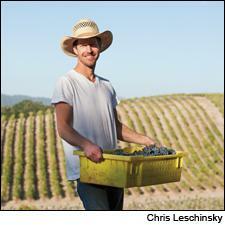 That changed when California companies added concrete winemaking vessels to their lineup. Since 2007, more than 400 California-produced concrete tanks and fermentors have been produced for the cellars of Staglin, Linne Calodo, Cliff Lede, Continuum, Wind Gap, Sandhi and dozens of other wineries. Many more are on their way. This was made possible because interested vintners approached two concrete companies, both of them led by wine lovers. Micah Utter is an artisan concrete maker, known for decorative patios and walkways in Paso Robles, who has dabbled in home winemaking. He founded the Vino Vessel branch of his business in 2007. Sonoma Cast’s Rosenblatt owns a vineyard in Sonoma and had a successful business designing and making sleek, modern concrete countertops, sinks and a furniture line sold at Restoration Hardware. Sonoma Cast added winemaking vessels to their lineup in 2010, using a proprietary concrete mix that gives them the flexibility to make concrete in an array of colors and textures. As far as functionality, concrete lies somewhere between stainless steel and oak barrels in the tool chest of a winemaker. Like stainless steel, they are neutral containers (though some claim they can impart a mineral note into a wine, depending on the type of grape and length of exposure). One of concrete’s biggest selling points is thick walls, effective at stabilizing temperatures, especially useful during fermentation. “I’ve never worried about temperature during fermentation with concrete,” said winemaker Jeff Cohn. Like a barrel, concrete is also known to soften a wine’s texture, though the reason why is up for debate. “They breathe,” said Rosenblatt. “But the air doesn’t come from the outside.” A tank’s interior surface can feel as smooth as glass, but there are actually microscopic pockets and nooks created by the concrete curing process. When full of wine, these nooks slowly release oxygen. Utter agrees with this concept, but he also suspects that the oxygen makes its way through the porous walls. Winemakers who want to avoid oxygen can have their tanks lined. Concrete is also customizable. “Winemakers are very particular,” said Utter, who estimates 40 percent of his units are made to order. Modifications include optional ports for racking and cleaning, heating and cooling coils and, of course, size. Utter sells a 70-gallon “tester” barrel for winemakers to experiment with, but most tanks range from 400 to 2,000 gallons, cost from $10,000 to $30,000 and have a 20- to 30-year lifespan. In contrast, a standard barrel is about 60 gallons, the best ones costing upwards of $1,000, and only last a few years before losing their potency. Smith’s vineyard-customized concrete will look like an inverted egg, or amphora shape—its narrowing base ideal for collecting sediment. It’s going to be years before wines aged in Smith’s containers can be tasted to see if they have any effect, but in the meantime, Smith is happy to see his idea come to light. With more California winemakers experimenting with these containers, more innovation is bound to happen. Rosenblatt has a suggestion. “Concrete bottles are next,” he said with a grin. Interesting. But to say concrete imparts no flavor or aroma seems unlikely. Have you ever noticed the smell of wet concrete? If the vessel is lined this may not be an issue and this becomes simply an economic benefit.